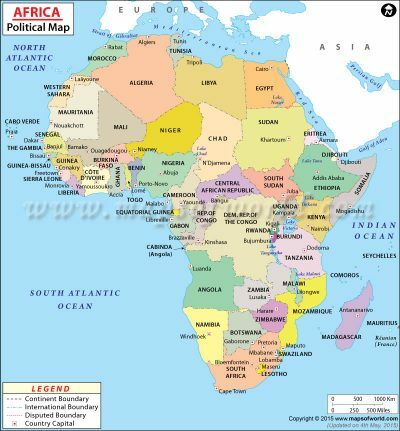 Gathering up a bunch of bits and pieces of geography studies about Africa we’ve done over the past year or so– for my own records and because I like to share good resources with others. Also, I’m always looking for more suggestions for our further geography adventures, so share your favorites in the comments. This week we finished reading Africa Trek by Dan Buettner, a book about a team of American and African cyclists who set the Guinness Book World Record for cycling across the continent of Africa from the northernmost point to the southernmost point. They start in Tunisia with their bikes’ rear wheels in the waters of the Mediterranean Sea and they end eight months later with their front wheels in the water at Cape Agulhas South Africa, where the South Atlantic and Indian Oceans meet. The book, written for young readers, is undoubtedly a highlights version of their long trek. But it introduces children to the continent of Africa in an entertaining and intriguing way. The trek is arduous and punctuated by bouts of malaria and dysentery, a detour around the Sahara to avoid both the harshness of the desert and a war zone, encounters with soldiers with guns in war-torn countries, they even witness a firefight. The team suffers from hunger and extreme conditions, two of them climb Mount Kilamanjaro, and then meet many fascinating people and see many interesting animals along the way. We read at a deliberately slow pace of about one or two chapters a week and did some googling and supplemental reading along the way. When we finished the book we watched the documentary the team made, which can be found on You Tube in its entirety, here: Africa Trek video. The sound and picture quality are sometimes a bit rough given the 1993 handheld camera the team was using, but the video was not to be missed. Both book and video highlight some of the political turmoil of Africa and the wide variety of cultures and the extremes of poverty and prosperity which exist. (On the way Bella noticed that at least one country on the map has changed names in the years since the book was written. We had to do some research to find out why.) You get a flavor for the vast differences in terrain and ecosystems and climate. And they arrive in South Africa just before the historic election of Nelson Mandela and even meet President F. W. de Klerk. But I liked that this wasn’t just a geography book, it’s also a story about perseverance in the face of extreme hardships. The struggles the various members of the team are inspiring and the triumph when they reach their goal is exhilarating. Before Africa Trek we read Hippos in the Night: Autobiographical Adventures in Africa by Christina Allen, a true story by an American biologist biking through the Great Rift Valley with a team of scientists. It’s a humorous account and felt a little less meaty than Africa Trek, but the kids enjoyed it. The story highlights animals, of course, but the author also visits several different tribes and writes about meeting various people as well. Her style is lighthearted and engaging and frequently self-deprecating. Both Africa Trek and Hippos in the Night are on the suggested reading list for 5th Grade (aka Level 2 Year 2) in the Mater Amabilis (Catholic Charlotte Mason) curriculum. I don’t follow Mater Amabilis faithfully, I found them too late after I’d already made some decisions that set us on a particular path and I’m not the kind to change direction easily. But I do always look to their lists for reading suggestions. I love the thoughtfulness of the curriculum and I love the discussions on their Facebook forum for support in implementing Charlotte Mason’s pedagogy. (i.e. help with narration, copywork, dicatation, nature study, etc). Misoso: Once Upon a Time Tales from Africa by Verna Aardema. A collection of 12 African folk tales. This has been our bedtime story book for the past few weeks. Each story has a short contextualizing note about the people who told the story, just a few lines about the tribe and where they live and maybe some other context to help understand the story, information about genre or storytelling styles. Each also has a short glossary of unfamiliar words. The kids and I have really enjoyed this colorful anthology, it has a real sensitivity to language and you get a real feeling of the orality of the tales. Also by Verna Aardema, Traveling to Tondo: A tale of the Nkundo of Zaire A handful of animals go on a quest. I really loved the rhythm of the language in this book. Delightful. Planting the trees of Kenya: the story of Wangari Maathai by Claire Nivola. Wangari Maathai was an internationally renowned Kenyan environmental political activist and Nobel laureate, this lovely picture book tells her story. This book could easily be cross posted for science, economics, and history as well as geography studies. We like to fill in our geography studies with documentaries. Books are lovely for getting a deeper experience but nothing beats being able to see a place and its animals, plants, and peoples and I am a big fan of using well-produced multimedia to expand our horizons (especially in the winter months when everyone is cooped up.) Ou favorites, hands-down have been BBC documentary series. We began with Blue Planet and then Wild China and then Wildest India and then Wildest Africa. Wildest Africa documentaries are perhaps not quite as stunning as the China and India series were, but they are really gorgeously filmed and beautifully narrated. (Currently on Netflix and Amazon ) Each episode focuses on a region and a habitat and investigates the people and the plants and animals of that region as well as the physical features and climate that make it unique. Highly recommended. Also looking forward to watching Africa’s Great Civilizations on PBS. We really liked this video about rhythm as the root of music. (I meant to link it in my leaning notes post a couple of weeks ago when I was posting about watching my friend Julia’s playlist for music fundamentals on You Tube, but I forgot to paste in the links. Well, here it is again: FOLI (there is no movement without rhythm). And I bought Sovietrek: A Journey by Bicycle Across Russia, a book about their journey across the Soviet Union right before its collapse. It looks fascinating. There is another book about a bike trip across Africa, East to West or West to East (I forget; it has been at least ten years!). We read it together with AfricaTrek – I had totally forgotten those books. Also Alexander McCall Smith (yes, he of the #1 Ladies Detective Agency) has a series of books about a little boy whose father is a game warden somewhere in Africa – Akimbo and… books. They are good, and Smith, who grew up in Rhodesia, knows his stuff. More “boy” books than otherwise, but they are just right for your boys’ ages. Ooh! Thanks. I’m putting the Akimbo books on hold at the library.